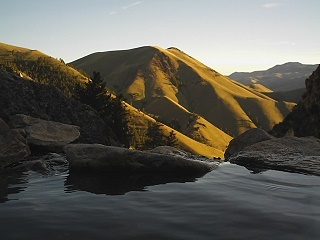 In a remote part of the state, nestled in rugged backcountry between the small towns of Salmon and Challis, is Idaho's most majestic high desert hot springs. A chain of 6 or so waterfall-fed pools are the reward for intrepid soak seekers willing to endure a grueling 2 mile hike up shade deprived switchbacks. Pool temperatures vary depending on the time of year from chilly to toasty. Dipping in a finger or toe is always a good idea before sticking a leg in. It's not often you encounter swimsuits given the remoteness of the area, but it might be a good idea to keep one handy just in case. Sun protection, extra water and food are a must especially during warmer months. The last half mile up is the steepest section of the entire route. While most of the path is through a desert landscape filled with sagebrush there are brief cool areas of relief near the creek among the junipers. Goldbug is well-known, and is used by many different types of soakers. The fairly difficult hike does little to deter the crowds. 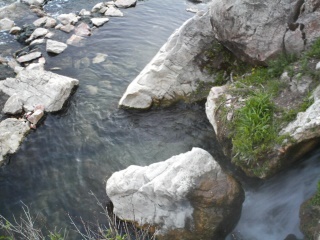 However, this hot springs is well cared for. The norm here is to pick up your trash and leave as little trace as possible. 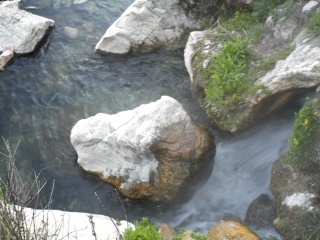 It is encouraging to encounter a hot springs where the majority of visitors are stewards. Expect a mostly non-swimsuit wearing crowd (signed as clothing optional area) that are polite and friendly. Watch for snakes during the warmer months; this area has many rattlesnakes and other kinds of snakes - the elevation and temperatures are just right. 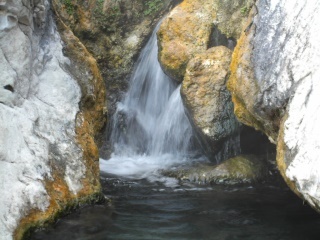 Sand and rock bottomed pools that are rock-walled and are fed by various sources, some in the form of hot waterfalls. 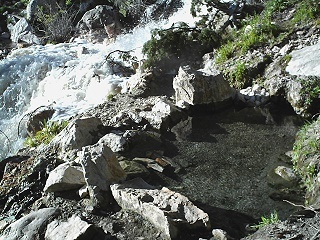 Goldbug Hot Springs is considered a true geothermal gem. While the pools reside on National Forest Land, the first quarter mile of trail passes through private land with an easement purchased and held by the Bureau of Land Management. Due to an overwhelming amount of traffic to the pools, private lands are being negatively impacted. Remember to always keep dogs on leashes and reduce noise levels to a minimum. Parking at the county managed trailhead is limited. Please be respectful of the surrounding landowners and avoid blocking driveways. Camping is not permitted at the trailhead. Overnight camping is prohibited within 500 feet of the hot springs. During the core of spring runoff you might be hard pressed to find a soaking pool that is warm enough... usually there is one - you just might have to search around a bit. The rest of the time is quite a different story... depending on the creek flow there can be anywhere between 2 to 10 soakable pools on each side of the creek. Accessible all year. The 1st quarter mile of the hike in is on private property, and there are no camping sites at or near the trailhead aside from a BLM recreation site a few miles down the highway. 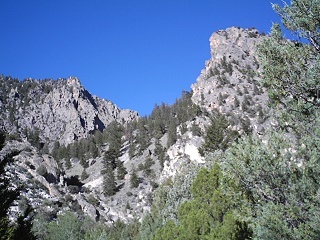 Between 1 and 2 miles in, there are a couple primitive campsites nestled in the junipers near the creek just off the trail that provide ample seclusion and shade. 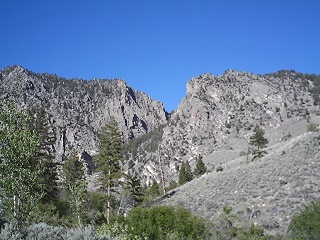 There are also stepped camping sites above the hot springs near the 4th bridge on the north and south sides of the creek. The stepped plots are fairly small, and would accommodate 2-person tents. They are all fairly close together, so don't bother unless you don't mind close company - because there will be company. 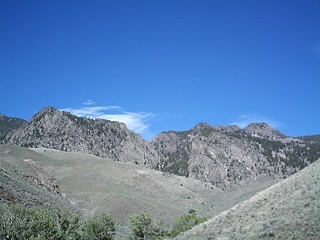 South of Salmon and north of Challis near mile marker 282 on highway 93, take a dirt road east a short distance to trailhead parking. Follow the marked trail 2 miles mostly up to reach the series of hot pools. 05.20.06: Getting closer... see the 'V' now? We left the trailhead a couple hours prior to sunset. Signage warned that the 1st quarter mile of the 3 mile trail crossed private land, and beyond were primitive camps and a bio-toilet near trail mile 2. Air temperatures were in the upper 80s (a rare occurrence this time of the year due to a warm front that broke many records) and shade was often hard to come by. I drank a ton of water... The last .5 mile to the springs proved to be the most difficult, after the 3rd bridge crossing. Just before the 4th bridge we were greeted by the 1st pool *sigh* - we were here. Further exploration lead to the discovery of the additional pools, although only 1 grouping was hot enough for soaking due to runoff. A local actually told me that today was the 1st day the water had been warm enough for a decent soak since runoff began. As we prepped to soak we were passed by a young couple on their way back down... grinning from ear to ear - I was soon to find out why. Initially, we soaked with another local that had been coming to the springs for at least 20 years. He was friendly, polite and truly respected this special place. After some banter and story swapping he left us to soak in private. I took it all in, the hot waterfall massage, stretching out in one of the coves and watching a diamondback curl around the inside of a cracked stump above a thermal vent. At one point I was enjoying the waterfall and thinking about the rattlesnake as a twig came down the falls and hit my shoulder... I launched myself out into the pool and received some quirky looks, then giggles once it was divulged that I had thought a snake slid down the water slide. I was quite relieved myself. Watching sunset from the pool in this unique place was incredible, I can't wait to do it again... only next time I'm adding sunrise to my mental to-do list.